John Taylor MP had purchased Bifrons, near Canterbury, in 1694, just before NPG 5320 was painted. Of his children, Brook Taylor (who was to inherit Bifrons in 1729), was already distinguished by his studies of music and numbers when NPG 5320 was painted, and he became a famous mathematician. For his portrait attributed to Lewis Goupy (NPG 1920) and further iconography, see J. Kerslake, National Portrait Gallery, Early Georgian Portraits, 1977, pp 275-76. 1) ‘... after standing in front of it, and examining it all over with his eyes close to the canvas’, see J. D. Stewart, Godfrey Kneller, 1983, p 49n64, quoting from a MS list of ‘The Taylor Pictures … written by Ernest Taylor who gave the pictures to Ernest and Netta Trench …’ then belonging to Mr & Mrs Trench. 2) Rogers 1981 acknowledged the help of J. D. Stewart in interpreting the iconography. 3) For Taylor: gu. three roses ar. barbed vert, a chief vair which it is impossible to identify in NPG 5320 although stated to be there (letter from John Hayes, 21 August 1980, on file). 4) M. Rogers, ‘John and John Baptist Closterman: a catalogue of their works’, Wal. Soc., XLIX, 1983, nos 95, 96; pls 38, 39. J. Kerslake, National Portrait Gallery, Early Georgian Portraits, 1977, p 276. M. Rogers, ‘John and John Baptist Closterman: a catalogue of their works’, Wal. Soc., XLIX, 1983, no.97. John Taylor of Bifrons, Kent;1 by descent to Ernest Taylor who gave it to Ernest and Nesta Trench; by descent to B. M. C. Trench; his sale, Sotheby’s, 9 July 1980, lot 129, bought Baskett;2 purchased October 1980. 1 Bifrons was rebuilt in 1770 by the Rev. E. Taylor and demolished in World War II by the Marquess of Conyngham. 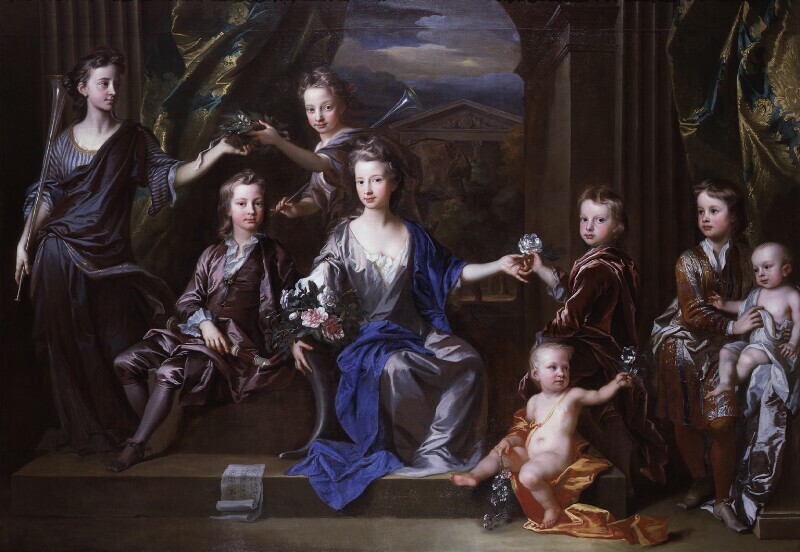 2 Bought at Sotheby’s by John Baskett for the Yale Center for British Art; an Export Licence was withheld and the picture bought by the NPG. Closterman, NPG, 1981, no.12; The Swagger Portrait, NPG, 1993, no.21; Beningbrough 1982–.